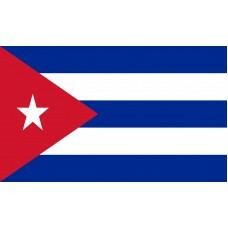 The Cuban flag consists of five alternating stripes, which are blue, white, blue, white, and blue. On the left side of the flag is a red triangle with one white 5-pointed star in the middle. The blue stripes represent the three states that the island had been divided into while it was under Spanish rule which were Central, Occidental, and Oriental. The two white stripes are symbolic of the devotion and strength expended by the soldiers during the battle for independence and the triangle represents "fraternity, equality and liberty," with the color red symbolizing the blood spilled and lives lost during the struggle for independence. The star on the Cuban flag represents freedom and is referred to as "La Estrella Solitaria," which translates as the "Lone Star." The Cuban flag was originally designed in 1849 and was raised for the first time in the city of Cardenas on May 19th, 1850, when only the city gained independence. It was officially raised to represent the nation as a whole on May 20th, 1902, when the nation became independent. 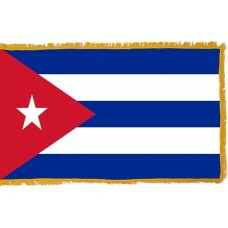 The Cuban flag was designed and created by Narciso Lopez, who was a Cuban exile and the poet, Miguel Teurbe Tolon. It was Miguel's wife that first stitched the flag and the flag was first flown when Narciso Lopez tried to free Cuba from Spanish rule but was defeated. Following the first attempt for freedom in 1850, Cuba tried again to gain independence in 1868 and a war began, which is known as the "Ten Years War." Following this war, Cuba fought again in two smaller wars, "The Little War" from 1879–1880 and the "Cuban War of Independence" from 1895-1898. During the Cuban War of Independence, the USA became involved, resulting in the "Spanish-American War." After the victory of the USA in this war and Cuba's independence from Spain, Cuba became an American Protectorate and it was the USA flag that was flown from January 1st, 1899 until 1902. In 1902, Cuba finally became independent, and became the "Republic of Cuba," even though the USA still had the right to be involved in Cuban affairs and politics. The flag was officially raised on the castles of "Tres Reyes Del Morro." The Spanish arrived in Cuba in 1511, after the island was discovered by Christopher Columbus and they claimed it as Spanish territory. During this period, African slaves and Chinese labourers were brought to the country to work on the sugar fields. The majority of the Chinese immigrants stayed and settled in Cuba, known as the Chinese Cubans. During the ten years war, the Chinese Cubans fought with the rebels, resulting in the death of 2,000. Cuba is the largest island in the Caribbean Sea and is a domain that consists of a group of small islands where the Atlantic Ocean meets with the Gulf of Mexico. It is sometimes referred to as "El Cocodrilo" due to the shape of the island resembling a crocodile from an aerial view. The capital of Cuba is called "Havana," or "La Habana" to the natives. Havana is home to a monument that pays tribute to the Cuban Chinese that lost their lives during the war. It is inscribed "There was not one Cuban Chinese deserter, not one Cuban Chinese traitor."